Egg allergy is very common: 1-in-30 (3-4%) are affected. The most common symptom of egg allergy is eczema. Egg white is the most allergenic. But people can also be allergic to the yolk. Babies who are just breastfed can also have egg allergy. Egg can get into breast milk though the mother’s diet. An egg allergy reaction through the breast milk can be subtle. Initially the baby gets irritable, and then as the weeks go by the baby’s face gets rashy. The next step is for the cheeks to become bright red, scaly and dry. Sometimes the skin will crack and weep. The baby begins to rub his cheeks on the bedding which damages the skin even more. The rash continues spreading to the chin, the neck and the creases of the arms and legs. Then the whole body begins to feel rough and a fine red rash appears. This progression occurs over a few weeks to months. To diagnose this type of reaction accurately needs is a skin test (or blood RAST test) for egg. If you eliminate egg entirely from your diet, the skin will improve with days. However, some people react to egg in a “slow-onset” type of reaction. This takes an hour or so to become established. Often this type of reaction is associated with nausea, vomiting and diarrhoea. People with this type of reaction have negative skin tests. If your child has chronic symptoms of eczema, or intermittent hives, then think about an egg allergy. Get this checked out by doing the allergy tests. 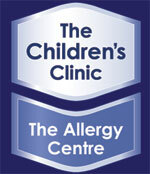 the Childrens Clinic | Allergy Centre will do your skin prick tests as part of the consultation.